4SM has been developped, as a personnal project, then as a hobby, in almost complete isolation, since 1994. 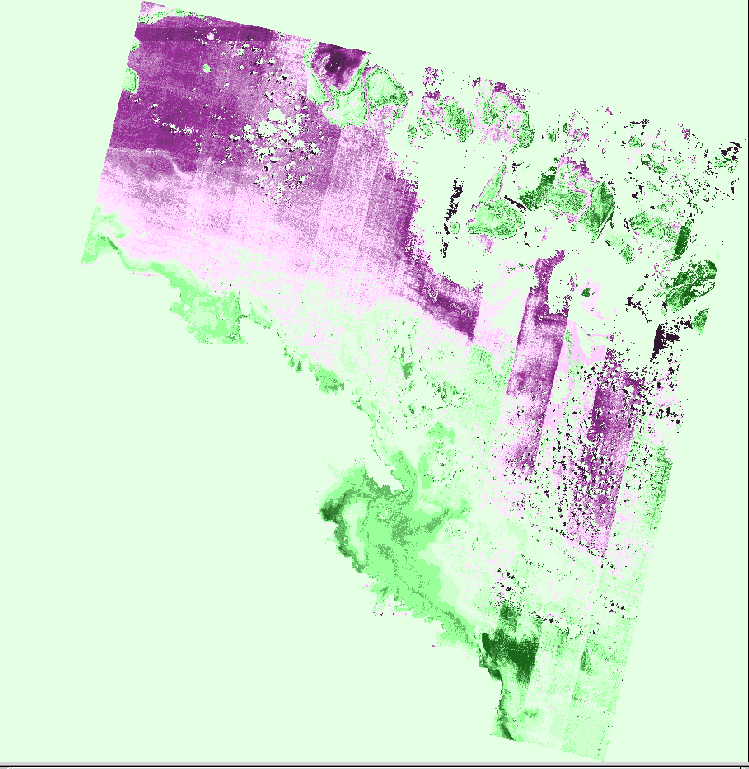 Using first a database of SPOT images, then a very few Landsat TM images. Then using a number of CASI hyperspectral images, and even an AAHIS image. Then using Landsat TM/ETM, HYPERION and OLI images, thanks to USGS's Glovis service. Then using WV2 thanks to Digital Globe. In 2013-2015, it has matured remarkably with the introduction of several breakthroughs using OLI, WV2, CASI, HYPERION and even HICO data. Starting in 2009, I was paid good money by a proeminent consultancy firm for projects using Landsat or WV2 in Tanzania, Bahamas, Bahrain, Western Australia, Seychelles, Red Sea, and the UAE. As for the UAE project, first for a limited AOI in 2013, then for an extension six months later, then for a further extension two years later. In an earlier life, I was involved for years in deep-sea minerals prospecting: particularly in charge of 3D modeling of a typical manganese nodules mining site in all its details: multibeam echosounding, deep-tow sonar and cameras, data reduction, fusion and management. Then I was denied by my employer any support for this very personal research which ventured in someone else's territory. To say it plainly: I was suppressed. Then in 1996: Bill PATZERT noted my presentation in Canberra, hosted me for a visit at JPL, where my simplistic approach failed to impress. Then in 1998: Walton CAMPBELL noted my presentation in 1998 in San Diego, hosted me for a visit to NRL at Stennis Space Center, where my simplistic approach failed to impress. Then in 1999, I was granted the right to pursue my goals, on a private basis. I feel bad that visitors to this website find it hard "to re-evaluate the current situation each time"
and even gave me some valuable $$$. with a pan-sharpened SPOT 5 image. Pleiades must be even better. yielded the true retrieved depth which only needed tide correction. Then he was relocated to working on the coasts of North Alaska and that was it! but 9/11 happened and he disappeared from Florida to resurface at IRD, Noumea, and remained silent since then. and also some valuable $$$. and a few WV2 images to play with. But his interest is in off-nadir-viewing heavily glinted images, and radar data! and he provided me several WV2 images to play with. he does not respond to me any more. that even CSIRO's Arnold Dekker appears to have given up on this case. 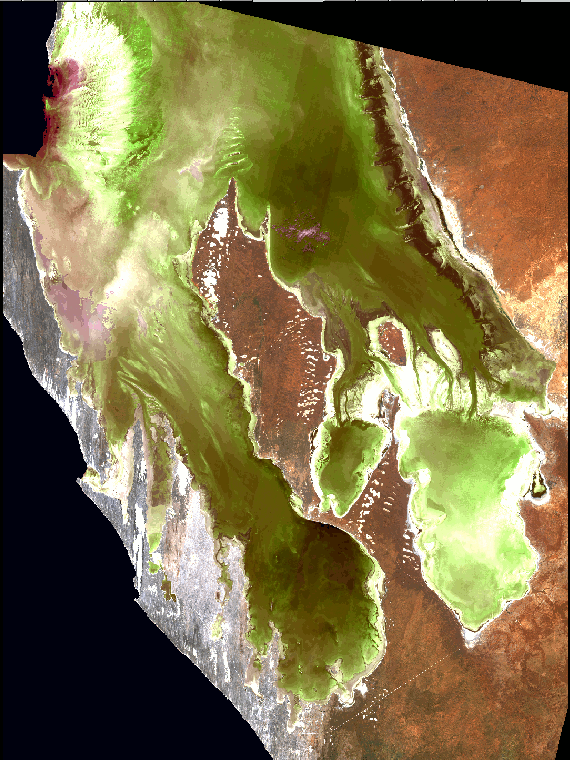 then in 2013 Landsat 8 OLIP showed up, and I got overwhelmed!!! That's why I was able to pursue the multiple dreams that haunted me since the start in 1994. I have demonstrated a quantum leap forward by showcasing the "PAN solution" for shallow water work. in the data provider's community, as it adds a new band to the multispectral bandset of Landsat 8, WV2, SPOT, PLEIADES, IKONOS, etc, for shallow water work. 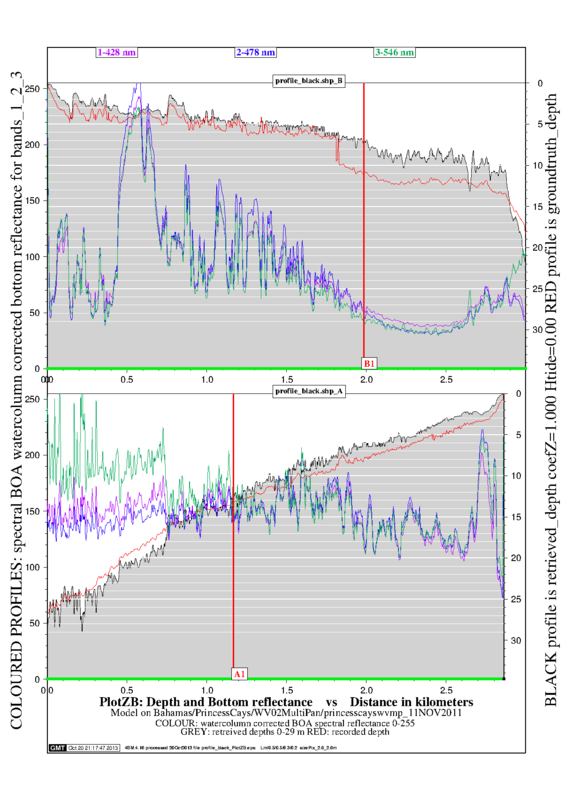 in the defense community, as it extends by a factor of ~4 in clear waters the reliability of the retrieved shallow depth range for the purpose of remote environment assessment. in the hydrographer's community, as it extends by a factor of ~4 in clear waters the reliability of the retrieved shallow depth range for the purpose of nautical chart updating. in the coastal manager's community, as it extends by a factor of ~4 in clear waters the reliability of the water column corrected shallow depth range for the purpose of "habitat" mapping and monitoring. improvement of the imagerie's S/N specifications shall allways be welcome. more spectral bands shall never hurt. narrower bands would not hurt. if you do also use the other bands + Pan"
You bet: the answer is YES. (I know: hard to keep up!!). then, as I extract an estimate of the atmospheric path radiance from the image, I then convert from TOA reflectance into BOA reflectance: this for consistent water column corrected reflectances for bottom type classifications. for the purpose of shallow water work. See below: this striping in OLI images is a shame!